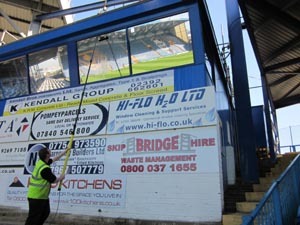 In 2001 operations manager John Cleeve started his new window cleaning business from his home in Portsmouth. Investing in the 'Reach & Wash' system in 2002, it soon became a well recognised and sought after company, particularly with leading property management companies, schools, offices and other local businesses. 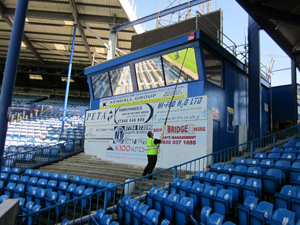 CFS Limited now carry out a variety of facilities services including commercial window cleaning, residential window cleaning, gutter cleaning and flush through, cladding and PVC wash-downs, and communal area cleaning within a 60 mile radius of Portsmouth. In 2013 the company moved to a new works unit in Waterlooville having out grown working from a smaller unit outside Portsmouth. The reason for this was primarily the need for larger water purifying methods, along with a requirement for more office & storage space. Our years of experience are constantly put to good use as we tackle difficult jobs on a daily basis helping us to evaluate the safest and most cost effective methods of our services in the South of England. The appearance, cleanliness and upkeep of your premises are critically important to you, your staff and your clients alike. From managed blocks to retail units, office blocks through to business parks, schools and residential premises, each of our contracts receives the same attention to detail. Dirty windows, fascias, soffits and blocked gutters can be detrimental to a company's image. Our regular, professional services will eliminate this problem. A Professional and reliable service, we believe that little bit extra... goes along way! Call us now. As members of the Federation of Window Cleaners (9091), CFS Ltd is fully compliant with current Health and safety legislation as required by the HSE, we have earned the Safe Contractor Approved accreditation as well as being members of Portsmouth's Trading Standards Square Deal for extra assurance. These facts combined with our highly trained safety conscious employees have enabled us to excel in the modern market.